You know I’m giving you lots and lots of actionable advice on my podcast and in my blog about how to gain your freedom by becoming self-employed. 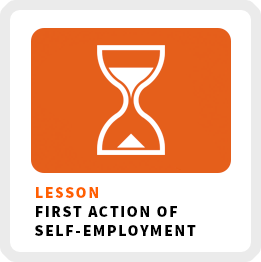 All of that advice doesn’t matter until you make the very first action of self-employment: making time to figure how to work for yourself. Making time also happens to be one of the biggest challenges to becoming self-employed. That time is going to come from somewhere. If you are going to start the process of working for yourself that means you are going to stop doing something else in your life to make room for it. You have a limited amount of time. When you commit time on a regular basis to figuring out how to work for yourself that’s the moment you’ve committed to it. You stop talking about what you want to do and start talking about what you’ve been doing to make this change happen in your life. Here are a few ideas for carving out time to figure out how to become self-employed. 1) Leave work on time and don’t go in any earlier than you have to. On average, the majority of people I coach, spend an hour more at work than they need to. Once you’ve made up your mind about working for yourself, your job now takes on the role of funding your business. Do only what you were hired to do. No more and no less. Leaving work on time will not only give you an hour back in your life to work on your business, but it will also force you to learn how to be more productive, so you can leave work on time. We all unproductive habits. Even yours truly! I don’t like referring to habits as “good” or “bad”. Either you have habits that are helping you achieve your goals, which I consider “productive” or habits that aren’t helping you achieve your goals, which I consider “unproductive”. I consider “restorative habits” like getting a good night’s rest, exercise and relaxing in a way that settles down your brain as productive. I bet you already know where you can steal some time away from your unproductive habits. If you don’t, start by monitoring how much screen time you spend watching TV shows, surfing the web or getting sucked into social media. You definitely have a couple of hours a week (or maybe even a day!) you can redirect toward working on your business. If you haven’t already or if it’s been a while, listen to episode 116. In that show, I describe my 5-step process for creating more time. Once you’ve figured out where the extra time is going to come from to work on your business, you’ll want to schedule time for it, so you can turn it into a habit. #1 Schedule time on your calendar for working on your business. You are now your most important client. Schedule time to work on your business as you would for anything else that’s a priority in your life. Defend that time. Make a short list of events that would take you away from it like family or health emergencies. Anything else outside of those few triggers should be regarded as distractions! #2 Assign specific actions during your scheduled time. You don’t want to spend your time mindlessly surfing the web. Don’t waste this valuable time! Give yourself specific assignments or activities. For example, commit to reaching out to 2 people a week who can help you build your business or spend 30 minutes a day working on a protype of your product or service. The best method for holding yourself accountable is to find someone who’s already self-employed you can check in on a weekly basis. It’s a powerful motivator to be answerable to someone other than yourself. Choose someone who will be supportive, but can also keep you on track. If you can’t think of anyone, consider joining the LSTM Mastermind. Now go find your extra hour in the day to start figuring out how to work for yourself!